1. To leave behind, to forsake, or to relinquish: Lucinda abandoned her newborn boy on the doorstep of a family in a better part town in hopes that he would have a better life there than he would with her. Abandon and its past tense form, abandoned, are words of wide significance, indicating the complete giving up or withdrawal from people or things of any kind. To abandon implies a previous association with responsibility for or control of something; so, a person may abandon or forsake, a house, friends, or even a family. 2. To desert, to give up, or to leave: The captain shouted to the crew, "Abandon ship!" 3. To discontinue, to quit, or to stop trying: The scientist abandoned his research because of a lack of funds. 4. Etymology: from the Old French phrase laisser a bandon, "to relinquish to another person's control". 1. Forsaken, deserted, or rejected: The abandoned house was torn down and new one was built to replace it. 2. A reference to, enthusiasm, being wild, or being uninhibited: The Gypsies danced with abandoned excitement. 3. Depraved, sinful, or wanton: Otto, the excessive pleasure-seeker, led an abandoned life. 1. To become humble, to degrade, or to bring low: The Bible says that the person who is overly proud of his or her accomplishments will be abased. 2. To bring down to size, to humiliate, or to disgrace: Emily's political opponent was abasing her perceived successful years in office. 3. To behave in such a way as to make oneself seem less deserving of respect: The two political candidates were insulting and abasing each other on TV, in newspapers, and on the radio. 4. 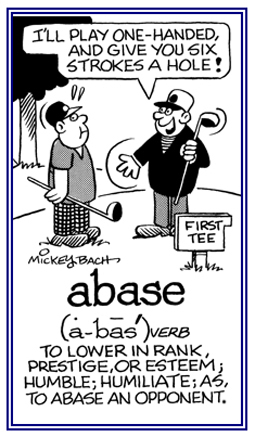 Etymology: from Late Latin bassus, "low". 1. To embarrass or to destroy a person's self confidence; to disconcert someone by upsetting his or her composure: The violinist was abashed when the string on her violin broke right in the middle of her recital. 2. Etymology: from Latin ex-, "out of" + baer "to gape, to be open"; from batare "to yawn, to gape". © ALL rights are reserved. 1. Embarrassed, ashamed, or self conscious: William was abashed because he forgot his wife's birthday. Matilda's abashed reaction was obvious when she was asked about what kind of job she had. 2. 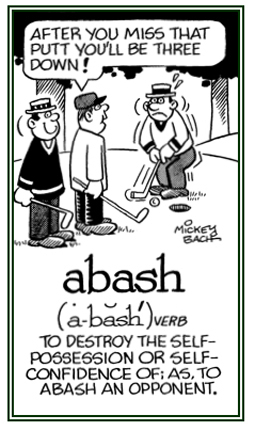 Etymology: Bah! was an exclamation of astonishment in Old French. 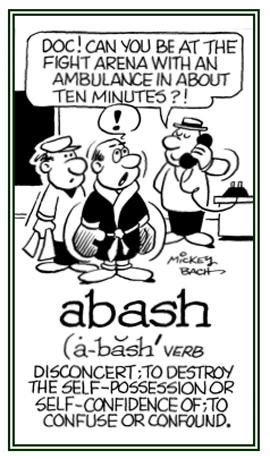 The English word abashed comes from Old French esbahir, "to get a bah out of someone" or "expressing impatient rejection or contempt". 1. A shortened form, an abridgment, or a condensation of a longer publication: Every Reader's Digest condensed book is an abbreviation of an originally longer work. Some abbreviation of Gary's speech was necessary because he didn't have enough time to deliver all of it. 2. Letters which are used to represent shortened forms or references to words or phrases: U.S.A., FBI, Calif., and Dr. are just a few abbreviations or shortened forms of words or phrases to represent the full terms. 3. Letters that are shortened references for a word or a phrase and which themselves are pronounceable as words: NATO, NASA, and UNICEF are types of abbreviations called acronyms; or abbreviations that may be pronounced as a word rather than just as a series of letters. Remember: an abbreviation is pronounced as separate letters (U.S.A., FBI) while an acronym may be pronounced as a word (NATO, NASA). 4. Etymology: from Middle French abréviation, from Late Latin abbreviationem, abbreviatio, from abbreviare "to make brief" from Latin ad, "to" + breviare "to shorten" from brevis "short, low, little, shallow". To kidnap, to take someone away illegally, using force, fraud, or any other similar method, and to keep that person confined against his or her will: Kidnappers abducted the child and kept him hidden from his parents until a ransom was paid. Abducting anyone is against the law and is severely punishable. 1. Taking people away illegally by using force or any other means, and to keep them confined against their wills: There has been an increase in the abduction of children in many parts of the world; especially, in certain African countries where significant numbers are forced to become members of rebel armies. 2. Etymology: from Latin abductionem, abductio,"a leading away"; from abducere, "to lead away, to take away" (often by force), from ab-, "away" + ducere, "to lead". 1. Irregularity; deviation; inconsistency: A flaw (defect or fault) in a lens that doesn't focus properly is called a spherical aberration. 2. Oddity; abnormalities; incongruity: The new rules were confusing and full of aberrations. 3. Quirk, eccentricity, peculiarity; Emanuel's only aberration was an occasional lapse of memory. 3. A deviation from the norm: The heat this summer was definitely an aberration from what people expected. The extreme wide-spread cold weather with snow and ice that some areas had this winter was an aberration. 4. 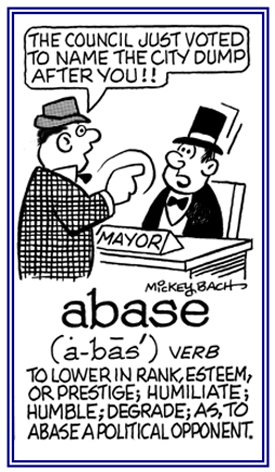 Etymology: from Latin aberrationem, aberratio. "a wandering, a straying"; from the stem of aberrare. "to wander out of the way, to lose the way, to go astray"; from ab-, "away" + errare, "to wander". 1. To approve, to encourage, and to support (an action or a plan of action); to urge and to help with: The doctor agreed to abet Ariana's application to apply to go to medical school. 2. To assist someone to do something; especially, something illegal: The robber was abetted by his brother who drove the get-a-way car away from the scene of the crime. 3. To assist someone to commit a crime, including planning the crime and helping the person to escape from the police, if it is necessary: It was amazing that, even though the head of the criminal gang was in jail, he was still able to abet his fellow conspirators in planning the bank robbery. 4. Etymology: from Old French abeter, "to incite, to tease," or "to bait another person". 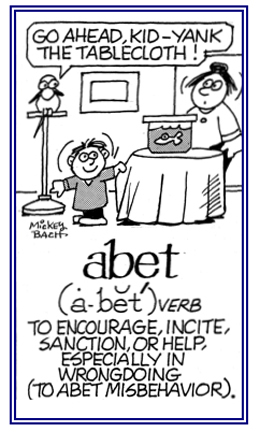 Abet comes from the baiting of wild animals or the ancient sport of bear baiting, and the English language has now taken this violent word meaning and applied it to people rather than to animals. This term goes far back to an old Teutonic origin that conjures up a picture of hardy men going to the chase with their packs of hunting dogs. Our English verb bite appeared long ago in a Low German derivative betan, meaning "to cause to bite, to make bite", as, to make dogs bite the bear, and so to send them out to hunt the bear. Icelandic beita meant "to feed, to make bite", and also "to hunt" with dogs. The French adopted both the sport and the Teutonic name for it, making the Old French verb beter, meaning "to bait" a bear, and abeter, "to excite, to incite", which we have taken into English as abet. No longer applied to the hunt, it now means to encourage or to incite people, usually in an evil enterprise. G. & C. Merriam Company; Springfield, Massachusetts; 1933; page 3. 1. Someone who assists, encourages, instigates, or supports another person with criminal intent in attempting or carrying out a crime; often used in the phrase "aid and abet": Mario was identified by the protected witness as the abettor in fixing the results of the automobile race. Santos was an abetter with the thief who was robbing the bank. 2. Etymology: from about 1374 (implied in abetting), from Old French abeter, "to bait, to harass with dogs"; literally, "to cause to bite" from à, "to" + beter "to bait", from a Germanic source, perhaps Low Franconian betan, "incite" or Old Norse beita, "cause to bite". Legally, abet is usually applied to aiding in the commission of a crime. In relation to the charge of "aiding and abetting", the term includes knowledge of the perpetrator's wrongful purpose, and encouragement, promotion or counsel of another person in the commission of the criminal offense. An abettor is legally considered to be an instigator, or "setter on"; someone who promotes or procures a crime to be committed. 1. A situation which is being temporarily set aside; a suspension: Mark was told that the building project would be held in abeyance until spring. 2. A condition in which legal ownership of an estate has not been established: The uncertain abeyance of her father’s property caused a great deal of anxiety for Dorothy; so, the decision of the judge is expected to be important. 3. Etymology: in its beginning, abeyance meant "waiting with gaping (open) mouth". Something "held in abeyance" may cause some anxiety or impatience, but it hardly suggests "open-mouthed expectancy"; nevertheless, that was originally the literal meaning for the word. 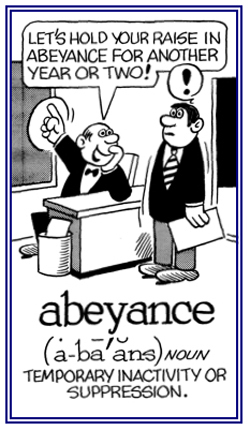 Abeyance came from the Late Latin badare, "to gape". The word passed into the Old French spelling baer, beer, "to gape, to look with open mouth, to expect". From this was derived the old French abeance, literally, "a gaping at", but used metaphorically to express "expectation" or "longing". This has resulted in the English abeyance, a legal term used about rights which were suspended, "held in abeyance", awaiting a proper claimant. Its meaning, however, has broadened in general use to indicate any kind of suspension or temporary suppression." G. & C. Merriam Company; Springfield, Massachusetts; 1933; page 4. 1. Temporarily set aside, suspended, or inactive: The president of the company waited to present the abeyant plan until more participants showed up. 2. A term that indicates that legal ownership of an estate has not been established: The abeyant nature of the settlement of Morgan's property left his daughter feeling insecure. 3. 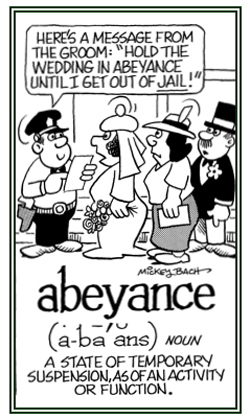 Etymology: in English, abeyance is a legal term used regarding rights which were suspended, "held in abeyance", awaiting a proper claimant. Its meaning, however, has broadened in general use to indicate any kind of suspension or temporary suppression. When anything is abeyant it is referring to a state of inaction, that the matter, whatever it was before, is now dormant; although some action might be expected to occur eventually. It was that expectancy that gave us the word, because it came as a law term, from the Norman Conquest, from the Old French abeance "a state of expectancy". The term referred; especially, to the condition of a property or title while, after the death of the former possessor, often by foul means in those days, his successor could be determined from among various claimants. The Old French word was derived from the verb beer (modern bayer), "to gape, to expect", perhaps because of the gaping expectancy with which the settlement of an estate was awaited either by the rightful heir or by a hopeful usurper, none too certain that his claim would pass scrutiny. Harper & Row, Publishers; New York; 1950, page 1. 1. To accept and to put up with or to tolerate: Bret can't abide loud noises because they hurt his ears. 2. To linger, to stay, or to hang around: When Helen was at the hospital, she asked Micah to abide with her for just a little while longer. Showing page 1 out of 7 pages of 103 main-word entries or main-word-entry groups.